The Freewinds at dock below the Queen Juliana Bridge in her home port at Willemstad, Curaçao. The location is steeped in Scientology history, for it was also here, in 1974, that L. Ron Hubbard docked the Sea Organization flagship Apollo. WELCOME ABOARDThrough the Freewinds welcoming reception, thousands of Scientologists and guests from more than 100 nations come aboard for religious services, conventions and special events throughout the year. The Freewinds is a universe unto herself. Scientology religious services lift individuals to the heights of spiritual enlightenment and are delivered in an accommodating environment where amenities of the highest aesthetic level befit the spiritual advance. KNOWLEDGE SOURCEThe Freewinds bookstore makes available all L. Ron Hubbard Dianetics and Scientology books and lectures and other scriptural materials. Serving Scientologists from around the world, the Freewinds bookstore provides religious materials in all translated languages. THE FREEWINDS LEGACYFrom the humanitarian legacy of L. Ron Hubbard she embodies, and the seafaring legacy of L. Ron Hubbard she upholds, the Freewinds is widely recognized across the Caribbean as a ship in a class of its own. STARLIGHT CABARETThe Starlight Cabaret holds weekly graduation ceremonies and other programs for passengers, including the annual convocation known as the Maiden Voyage Anniversary of the Freewinds, a week-long celebration for leading Scientologists from around the world. The Starlight also hosts special seminars for officials, military, police and interfaith groups from throughout the islands and across Central and South America. LA PALOMA BLANCAIn La Paloma Blanca—The White Dove—passengers and guests gather after graduations, concerts, recitals, seminars and other events held in the adjoining Starlight Cabaret. Here too, Freewinds officers welcome dignitaries and maritime officials from ports across the Caribbean. In addition to the numerous receptions and events hosted there, La Paloma Blanca serves passengers daily during breaks in their studies and spiritual counseling sessions, known as auditing. OFF THE PLANETARY CROSSROADS From stem to stern, the Freewinds is the ultimate distraction-free environment—devoted to seeing that every Scientologist attains their goal of spiritual freedom, while supporting Church humanitarian initiatives that are freely extended to those who seek to implement them in their Caribbean communities. IDEAL ENVIRONMENTThe Freewinds provides the ideal environment for study, empowering Scientologists to gain the knowledge required to attain the highest spiritual levels. FREEWINDS ACADEMYIn the Freewinds Academy, students acquire the fundamental truths of life contained in the Golden Age of Knowledge Courses—the complete Dianetics and Scientology study that is essential to their spiritual eternity. The Academy is also where Scientologists study Freewinds-only courses including the renowned Competence and Leadership that greatly enhances one’s abilities in environmental control and target attainment. INFINITE HORIZONThe Freewinds experience includes the ever-present panorama of the open sea, where one can cast the eye and the spirit along an infinite horizon. PROMENADE DECKThe Promenade Deck is an always-bustling passenger hub on the Freewinds—for activities under the Caribbean sun or the equatorial stars. SKY LOUNGEThe Sky Lounge is an informal gathering place for snacks and meals throughout the day or after an evening Freewinds event. POOL DECKThe Pool Deck is another carefully-crafted Freewinds space—for enjoying a refreshing tropical beverage from the Sky Lounge, a swim in the lap pool or a contemplative moment in a Caribbean sunset. SUN DECKThe topside Sun Deck with its 360-degree view of the Caribbean is the popular site for receptions, banquets and after-event socializing. Delegates to all Freewinds conventions attend seminars or special events on the Sun Deck hosted by ship’s officers and crew. FREEWINDS BRIDGEThe Freewinds technologically advanced bridge attains the L. Ron Hubbard standard of maritime excellence. The 21st-century digital navigational system with differential global positioning satellite pinpoints a position within 50 feet. There is also advanced digitized radar for a 96-mile wraparound view—extending even beyond the horizon—and an electronic chart display and information system. 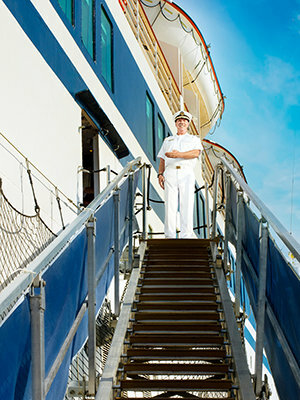 The highly skilled officers and crew of the Freewinds—all members of the Sea Organization, the Scientology religious order—ensure the ship operates at an unparalleled level of safety and performance for passenger ships at sea. While most ships have only one Master, the Freewinds has five Master Mariners, all certified for any ocean and any tonnage. “Shipshape” attains an entirely new level of meaning on the Freewinds. Her pristine condition sets the standard for the maritime industry. ENGINE ROOMThe Engine Control Center is the soul of the Freewinds. The center is fully digitized and displays the ship’s vital signs at a glance—engine temperature, oil pressure, fuel, water and lubricant levels. The control center houses a closed-circuit viewing system that enables engineers to monitor performance levels of all critical machinery powering the Freewinds. Manned by 9 certified Engine Room Officers and 4 Chief Engineers, it is among the most highly trained and skilled crews on the 7 seas. The Engine Room is a model of order and efficiency, including every system color coded in accordance with specifications laid out by L. Ron Hubbard for engineering proficiency. COMMODOREThe Office of the Commodore stands in recognition of L. Ron Hubbard as Master Mariner, Founder of the Scientology religion, and Commodore of the Sea Organization. Scientologists not only progress upward on their spiritual journey upon the high seas, they contribute tens of thousands of volunteer hours to Church-supported humanitarian missions that are implemented by the Freewinds wherever it sails. Civic and religious leaders from throughout the islands and Latin America recognize the Freewinds as a place of profound personal renewal, but also as a source of solutions to meet their needs through the Church’s humanitarian programs and interfaith initiatives. Drug education, human rights, literacy, learning and ethics are part of the broader social mission through which the Freewinds has spawned partnerships. With the help of island port and civic officials, national police and military services in Colombia, Venezuela and Ecuador, the message of human rights and humanitarian action is coming to all. To the maritime community, the Freewinds is a model of quality, service and safety, the only civilian ship on the high seas designated as an official training platform by the United Nations International Maritime Organization. In discharging that responsibility, the highly trained and experienced Freewinds officers and crew have provided safety and security training for more than 100 Caribbean port authorities, coast guards and maritime organizations. The beacon of the Freewinds shines with the promise of a better life, a better world and the accomplishment of dreams. It carries a signal of hope when seas are stormy and when the path is unclear, bringing a meaning to the spirituality that underlies its larger mission—to light the way toward an infinitely better existence.